Puglia can be very warm: be aware of what to wear in Italy in summer to pack right! Birthday parties aren’t my thing. That’s the main reason why every year I choose to leave for a trip, rather than having to deal with cake and candles.. This year for my birthday we decided to explore a part of Italy off the beaten path: Puglia. 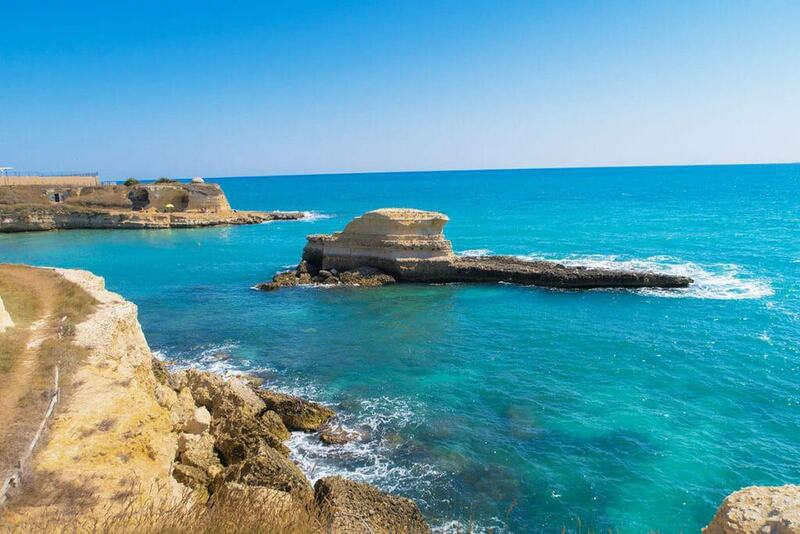 Or better, the Salento area, which is becoming a particularly popular destination. Full disclosure: before I got to Torre dell’Orso, where the Expeloo group found us a place, I had no idea what to expect. After all, I’d heard everything and its opposite about Puglia! 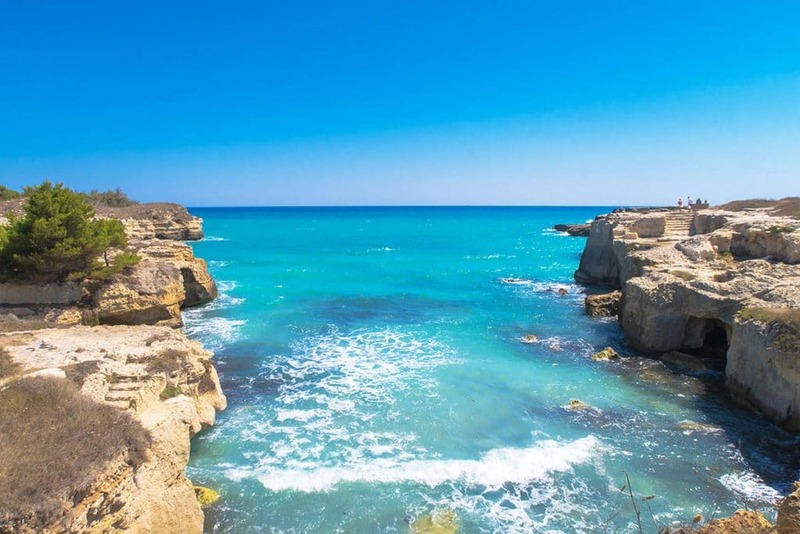 Salento is the Southern part of Puglia, between the Ionian Sea and the Adriatic Sea. We could say it’s the “heel” of Italy, if you see my peninsula as a big boot in the European map. It includes the entire province of Lecce, a big chunk of the Brindisi provice and part of the Taranto area. Tourism here is one of the main sources of income, especially during the Summer. However, too many people only visit Porto Cesareo, Gallipoli or Lecce, without exploring the lesser famous areas. … or they just want to vegetate on the beach, missing all the wonderful things the Salento has to offer! 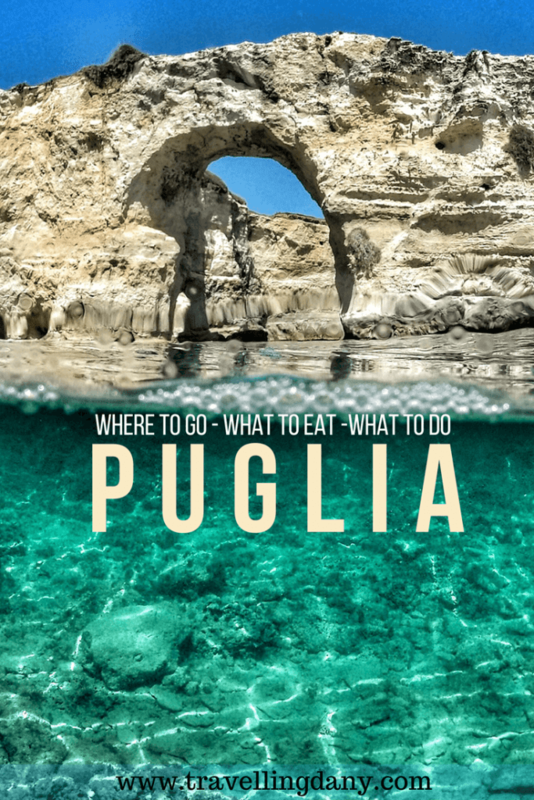 Of course, we can’t blame them, but we’d still like to show you a few juicy tips and things to see that you could incorporate in your next trip to Puglia. 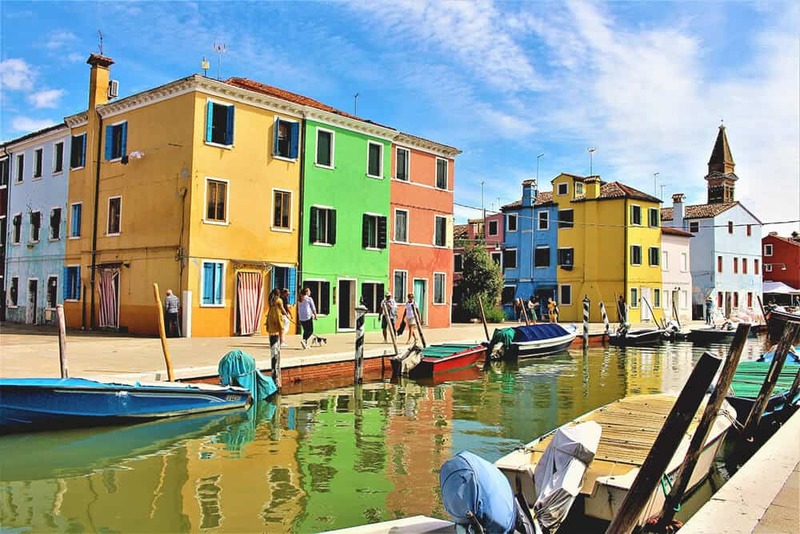 After all, you can explore Italy off the beaten track even starting from the most popular cities. It is important to note that Puglia is a windy region. As Salentines have said, this area goes through periods with extreme heat and others in which the tramontane blows for days, making it impossible to even think of diving into its turquoise waters. Of course, the wind helps to overcome the torrid Summer days, but as we soon discovered… it is also quite annoying. As soon as we arrived we immediately started exploring Torre dell’Orso and the surrounding area, but the tramontane was so strong that even getting closer to the cliffs was dangerous for us and our photographic equipment. Saltwater is not a friend of your camera, so unless you use a waterproof case on an action camera, it’s better to avoid keeping it too long in the open. The nice dress I brought, that I hoped to wear for dinner? It had to stay in my suitcase, unless I wanted to replicate the scene played by Marilyn Monroe in “The seven year itch“: I don’t have the phisique du role! Yet as soon as the wind subsided, the beach at Torre dell’Orso has been invaded by tourists. I’ve never seen anything like that! To reach the sea, literally, you had to walk on a carpet made of towels and bodies laying in the sun. I hate this kind of places and so we went looking for another place where we could enjoy a nice swim. The beach of Torre Sant’Andrea is a very suggestive little place, though, especially in July and August, it will still be crowded (not as much as Torre dell’Orso!). The high cliffs shelter the area from the wind, so the small beach between the sea stacks is perfect even when the wind is particularly strong. If you don’t mind to lay down on the rocks, the most characteristic coves are accessible through small, almost hidden trails along the coast. If you prefer the sand, you will find a tiny, sandy beach not far from the small village of Torre Sant’Andrea, from which you can admire what the locals call the “Sphinx Rock“. In the evening, in fact, this long rock formation resembles a small Egyptian sphinx! As you might have guessed already, the best way to experience a tour of Italy off the beaten track is by renting a car… or maybe a Vespa! Another particularly beautiful and less crowded area (probably because there are no sandy beaches), is the Grotta della Poesia (Cave of Poetry). According to a legend, a beautiful princess came here to bathe in the turquoise waters of this cave. The news spread very soon, and so a multitude of poets and writers began to come to this place to write verses, that is where the name comes from! This is one of the ten most beautiful natural pools in the world. A ladder carved in the stone will allow you to get down to the water, but the most popular method tourists and locals use to enter the cave … is to jump off the nearby cliffs! Another very nice beach I recommend is the Baia dei Turchi. However, just like Torre dell’Orso, it’s better to visit in less crowded period. So book a trip to Puglia in late Spring, or June at the latest. Some locals also told us that September and October are also good times, as schools reopen and many of the families who come to Puglia on vacation will leave. A few steps away from the Cave of Poetry, a Messapic worship site has recently been discovered. On the road that goes from Torre dell’Orso to San Foca you will find a new Archaeological Area. The entrance is free and at certain times there are guides who will tell you legends and historical information about this area. Mind you: I have no idea if they do speak English! 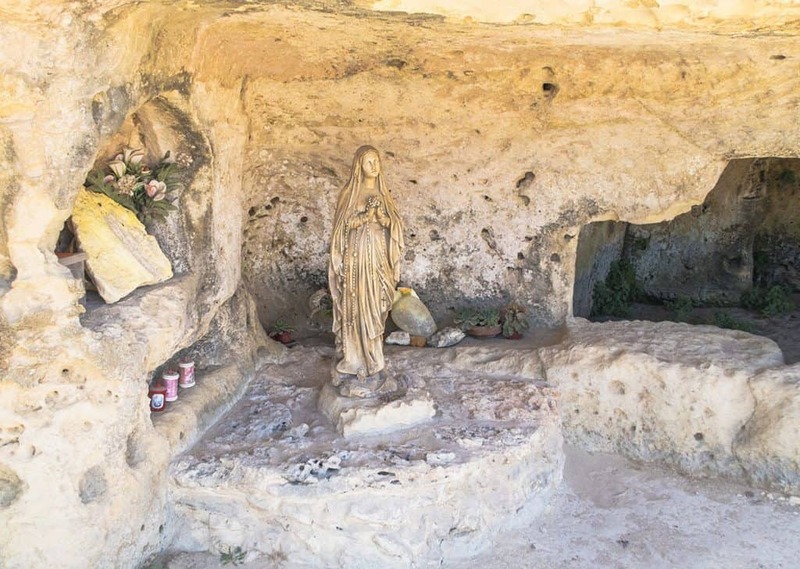 A few steps away from the Grotta, in what looks like a small temple carved into the rock, you will find a statue of the Virgin Mary. It seems that here there was an apparition of the “Madonna di Roca“. 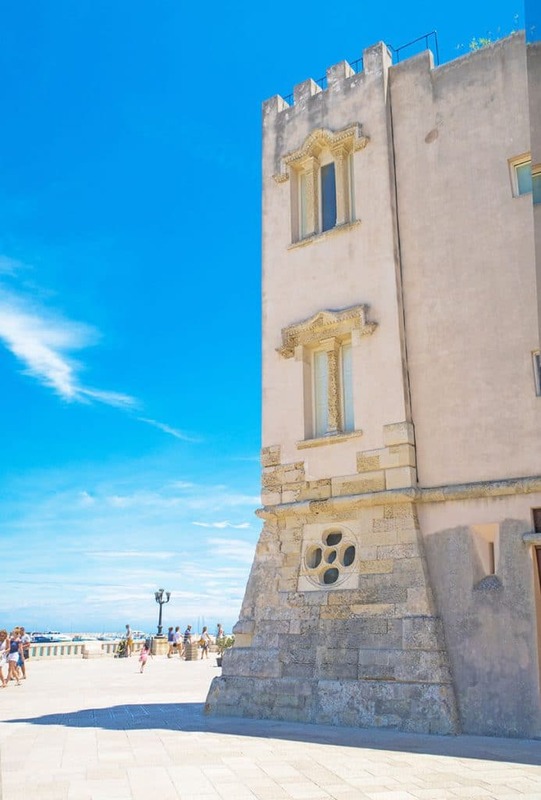 From this point you can also see the Roca Tower and the Messapic fortifications of Roca Vecchia. As we continued our tour of Italy off the beaten track, we found some images online of the beautiful rock formations at Torre Sant’Andrea, that I mentioned before. Well, getting as close as possible to the coast, trying to find a scenic spot that would allow us to take some beautiful photos seemed impossible. Until we found a little street with a nice parking lot to leave our car. From there a very easy hike (I suggest you use your sneakers for this) will guide to a series of beautiful viewpoints. Stone arches, hidden coves, turquoise waters and above all … absolute silence. We were completely on our own, except for a few people who passed by, walking their dogs. Once there you should find a free parking lot where you can leave your car. Another tip for a Summer getaway off the beaten track in Salento is to spend a day at the Alimini Lakes. Especially in the Summer, in fact, they are mainly frequented by the locals fleeing from the overcrowded beaches and therefore particularly quiet. These are two small lakes located North of Otranto, connected to each other by a channel called “Lu Strittu“. The Alimini Lakes are surrounded by thick pine forests and Mediterranean vegetation. On the North side you will find numerous springs, including Zudrea, the one that feeds Alimini Grande along with the sea. In this area you can go hiking or horse trekking, and the woods are especially appreciated by the birdwatchers. Renting the rowing boats, for a romantic two-trip trip on the placid waters of Alimini Grande, is also a popular activity. From the oasis of the Alimini Lakes you can also reach the Baia dei Turchi. Among the myriad of architectural and natural beauties, don’t miss a visit to the Bauxite Lake. This lake, also known as “Red Lake“, was once a quarry from which they extracted materials to make aluminum materials. When the quarry got closed, the basin filled with water, making it what you can see today. If you’ve been to any of the beautiful USA Canyons, then it will feel like this place belongs to Utah or Arizona! The waters are emerald green (colored by the remaining bauxite) and the surrounding rocks vary from bright yellow to deep red: this is a fascinating example of how nature can regain its territory after human exploitation. A few steps from the lake there is a large pine forest where you can stop for a picnic in the shade of evergreen trees. If you want to enjoy your trip in Italy off the beaten track, then you might want to head to Otranto. Its beautiful historical city center deserves at least half a day. You can access it through the majestic Porta Alfonsina, the oldest entrance to the city. The small village, enclosed in Aragonese walls, is made up of stone streets, narrow staircases and craft shops, which converge to the magnificent Cathedral, one of the largest in Puglia. If you want to get into the Diocesan Museum, you can access it from Palazzo Lopez, on Piazza Basilica. We opted to walk up to the Aragonese Castle, which partly overlooks the sea. In the Summer, especially in the morning, most tourists go to the beaches, while in the evening this area is particularly chaotic and busy. So be smart and plan a visit in the morning! 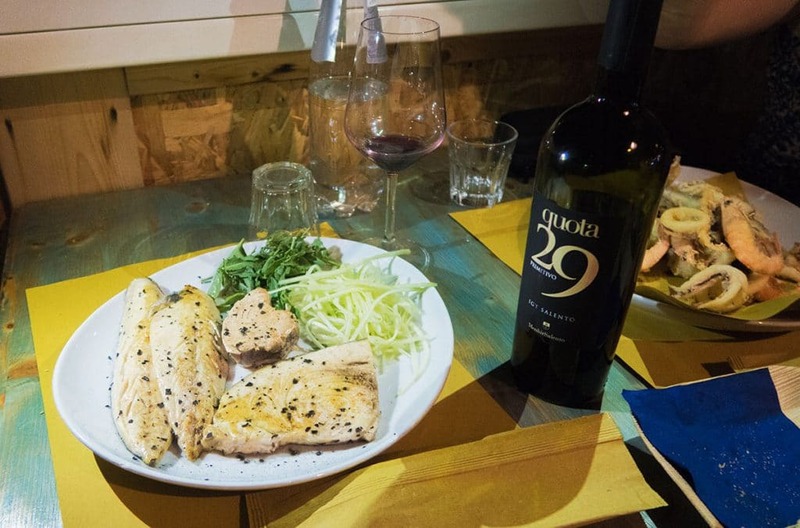 The king of the Salento table is, of course, the amazingly fresh fish. In spite of the fact that we have visited many villages, we only found one place to eat a good grilled steak, in San Foca. The Braceria Macelleria San Foca is, a butcher shop that in the evening becomes a tiny little restaurant where you are welcomed with kindness and expertise. We tasted delicious dishes from Puglia, such as bean puree, chicory with pork, “frise” and many other fresh vegetables. We were then presented a mixed grilled meat plate that was even too much for us! The huge surprise were the Turcinieddhi, roasted lamb chops, twisted in lamb guts and grilled (you will appreciate them also during a trip to Italy in Winter, especially during the holidays). Accompanying everything with a good Primitivo red wine, we finished our dinner with a spumone, a traditional Salento gelato, filled with sponge cake and hazelnuts. Primitivo is a great souvenir from Italy but make sure you can bring it home! If you don’t know about our Italy tipping etiquette you can check here: I also added a few Italian sentences that will be useful during your trip! Another place where we ate divinely is Osteria Mesciu Chiapparu at Borgo Sant’Antonio. The place is really small and always full, so unless you want to wait (as we did! ), it’d be wise to book your table in advance! Here the fish dominates the menu, even though meat dishes are also served. The owner and employees made us feel right at home, offering us some excellent raw shrimps fished in the morning: they vanished in a matter of minutes! From appetizers to desserts, you have the chance to sample all the best Salento traditional recipes, at really affordable prices. 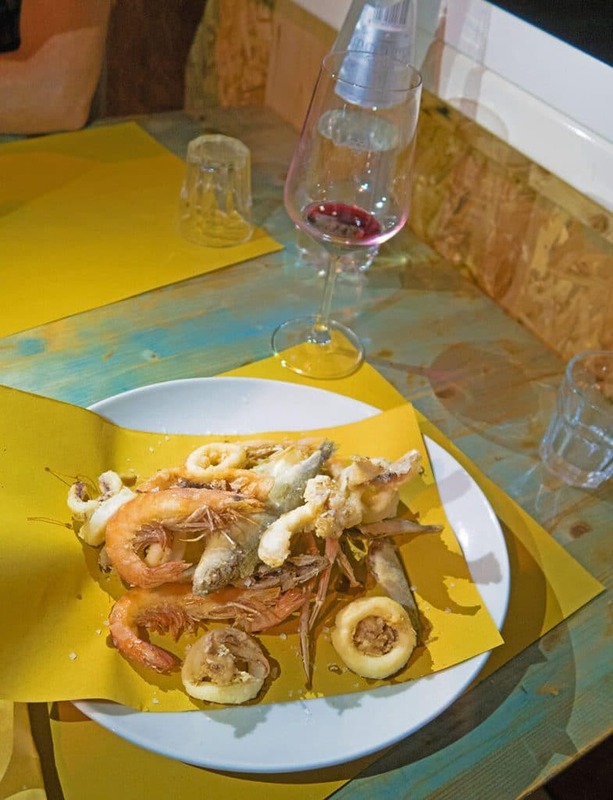 To be honest, we strongly believe that you can experience our Italy off the beaten track through food tasting and the best way to do so is to avoid the many tourist traps that await for you along the coast! The bonus? The stray dogs adopted by the restaurant, who quietly wait for the customers to leave to have their own bowl of food. 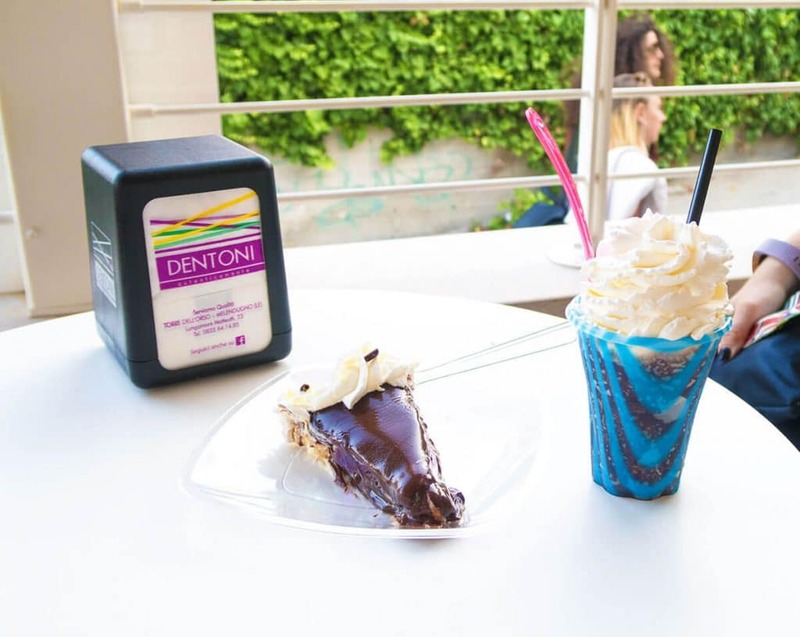 The most famous pastry in Salento, now known throughout Italy, is located in Torre dell’Orso: Dentoni. To my delight, we could walk her up every morning to have breakfast with the local delicacies, first of all the iced coffee with almond milk, served only in the Summer. One of the best-known Salento cakes is the Pasticciotto: a delicious soft pastry that holds a light, sweet cream. Lately the locals have also invented a chocolate version, absolutely delicious, Salento’s tribute to the former President of the United States of America: the Obama. Dentoni is also famous for the Torta Crepes, which is especially popular in Summer (probably because they keep it in the fridge and serve it fresh). It’s made of seven layers of crepes stuffed with a very light and fresh cream, with a last layer of Nutella, decorated with whipped cream, chocolate curls and hazelnut grains. Needless to say, I already miss it! We have been invited by Expeloo, “Experience Local Organization“, a company born from the ideas of a group of young people from the Salento, who wanted to introduce the wonders of their land to the world. 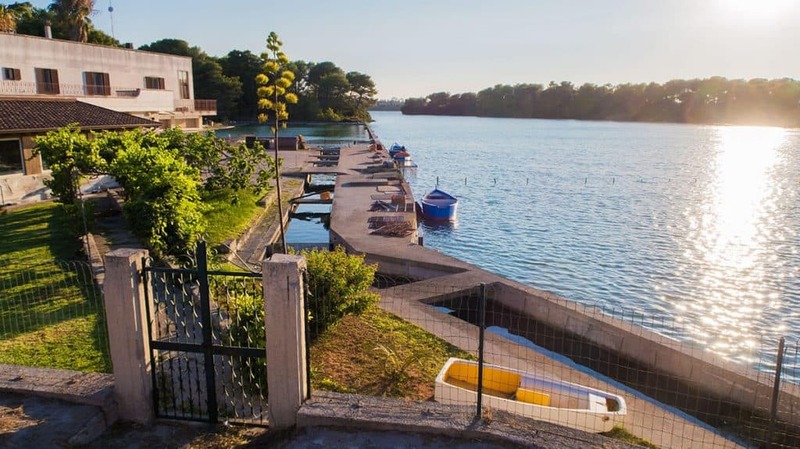 They handle the accommodation facilities located in various locations in the Salento, mainly apartments for short or long-term stays, suitable for every need (young couples, families, pets, etc.). The promotion of the territory is at the center of all the initiatives of these young folks who have decided to focus an area that is perhaps too often underrated. They can plan foodie tours, short courses to teach you how to make pasta, naturalistic experiences with quads or on horseback, and even wine tasting tours. We were very impressed by the fact that it is a company created and managed only by young people, which is uncommon in Italy. They decided to start working hard and are always ready to welcome their guests with anecdotes or suggestions to help you to enjoy your trip in Puglia. If you are looking to find a place to stay in Salento, contact them to ask for information: they speak a very good English! After all, the best way to experience a tour of Italy off the beaten track is… to ask the locals! Puglia looks so ravishing. A place that looks so surreal, it seems to have materialized from an artist’s imagination. We would love to get there next time we are in those parts. Definitely an Italy beyond Rome, Venice, and Florence. Oh yes and Campania region, Naples and the Amalfi Coast are awesome! (Yes, I’m biased! :D) A Vespa ride in Puglia is absolutely suggested, especially because Summer can be torrid! The water looked amazing. It may have been a bit choppy for swimming but I could watch at it all day. I would hope I was eating some of those pastries too. Haha I’m still dreaming about the pastries, too! Ahhhhh. Beautiful blue waters. I absolutely love going off the beaten path as well. And just like you I take a teip every year for my birthday which is so much more fun than material things. I’ve never even heard about Puglia but I will add it to my list. Great photos!!! We loved Pulglia. We were in the region after the summer season and some of the beach communities were like ghost towns. However, it was nice to have beaches and coast line to ourselves. We were over there a couple of weeks ago and it was SO crowded on the beach! But yes the locals told us that Spring and Autumn are dead seasons. The Expeloo team is trying to work on tourism also during those seasons, with pasta making lessons and horse riding trips! The region has so much to offer but mostly people focus on the beaches! Make sure you’re adding also Naples and the Amalfi coast to your list! I haven’t heard about Puglia ever. This is such a scenic part of Offbeat Italy. Thank you for showing us this part of Italy. Taking a rented card or quintessential vespa are the best way you can escape city madness and soak into the Italian beauty. Loved the experience. You know, exploring with a Vespa here or the Amalfi coast is just about the coolest thing ever, it’s iconic and so much fun! What a wonderful place to spend your birthday! The water looks amazing here! That blue water, the fresh fish, that “off the beaten path” experience….all right up our alley. It embodies everything we love about Italy (our favorite). To ride around on a Vespa, exploring, would be a dream. Will add it to our list for next time! 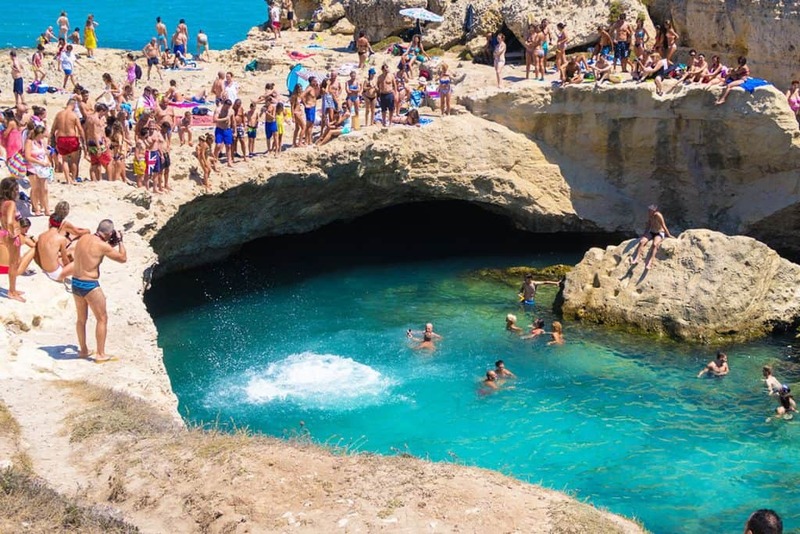 I’ve visited Bari, Alberobello and Polignano a Mare in Apulia and Salento was just added to my bucket list! Southern Italy is just magic! This is a perfect mini guide to Puglia..thanks for sharing. I love to Grotta della Poesia and jump…maybe a few times…would be so much fun. 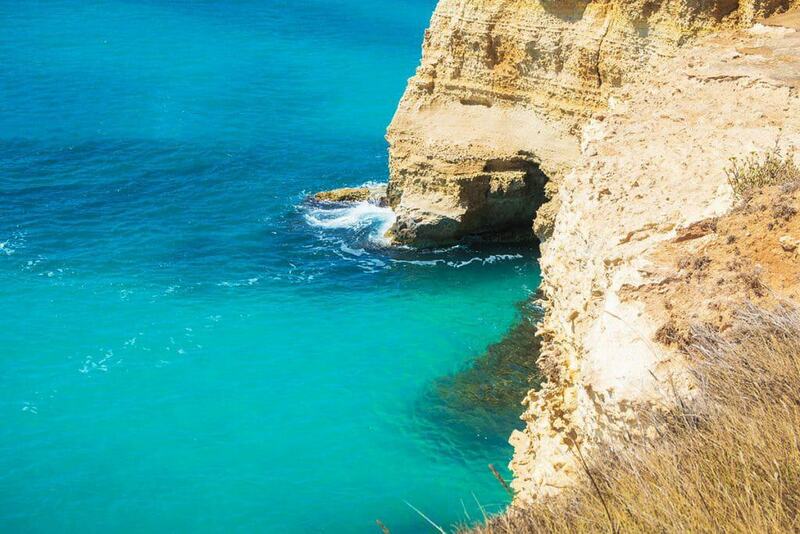 The sea looks lovely blue everywhere…perfect for a beach vacation! I am not a birthday party person either. I am more of a take a trip for my birthday too, but I still want the cake. Looks like a great trip and time. What a great way to celebrate your birthday! I completely agree going on a trip is so much better than any birthday party. Such a stunning place to visit! 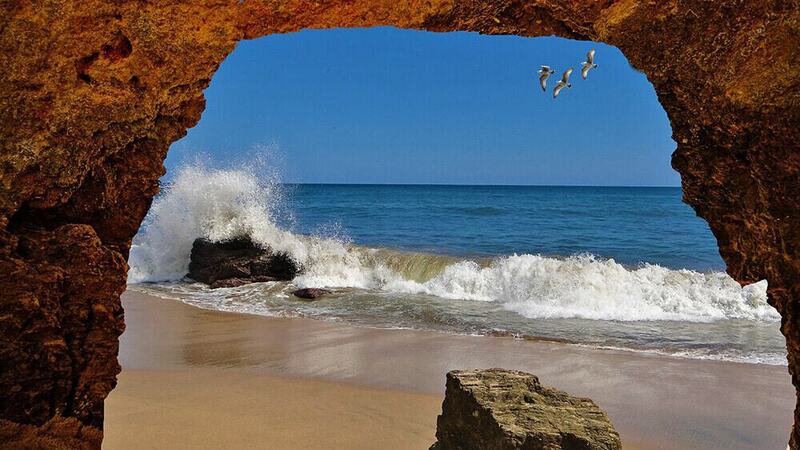 The water looks so inviting and beautiful! Those azure waters of Italy are gorgeous. And off the beaten track is so much better – if it stays off the beaten track for long! Nothing worse than crowds of people. Happy belated birthday, this looks like the perfect place to celebrate! The cliff jumping looks like a lot of fun, and some of the coastal areas remind me a bit of Greece. Either way, adding it to my list! I love the idea of a new place every year to celebrate your birthday! Happy belated b-day ? Puglia will definitely be added to our ever growing Italy destinations list! Gorgeous places, just the place I want to be in the summer time. I will check them out next time I am over there. Cheers! Fantastic way to celebrate your birthday – I think I’ll follow that tip!! 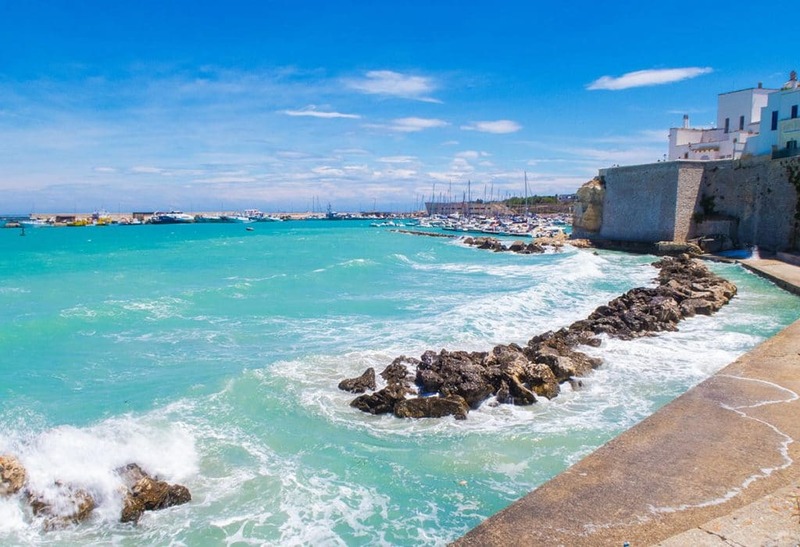 Puglia looks like an interesting destination with something for everyone – even the wind!! 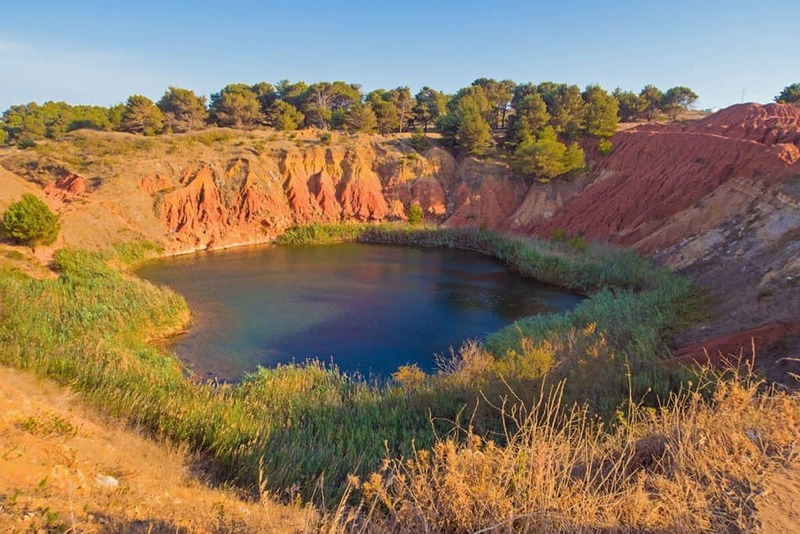 I also prefer the less crowded areas, so your description of Torre Sant’Andrea and the Cave of Poetry sound very appealing – as does the Red Lake. And fresh seafood would make the best birthday feast! That is really a good place to head for a birthday. Love these places as it’s really out of the touristy place. Chilling and having those divine foods are champions in life. We love discovering places off the beaten track. Puglia looks like the perfect place to explore by camper to beat the crowds. Will definitely be adding this to our list of places to visit next year! An interesting post and I like the way you have shown the pics. Torre Sant’Andrea looks like a must visit beach while I miss the Vitamin Sea. Thank you for informing about the Bauxite lake, the way it was formed and the significance it holds. Wow! The food, the buildings, that AMAZING swimming hole! It looks like Puglia is a dream getaway! Interesting to know that that Pulia is the windy region of Italy! We have a photography project and love when a place has a lot of wind so this is actually a huge perk to visit this part of the country! I had no idea southern Italy was so picturesque and colourful. The view from the Aragonese Castle must be wonderful, I’d try get up there at sunset. I’m showing these pictures to my friend to discuss about visiting the heel of Italy. I haven’t been to Puglia even though I have been to Italy numerous times. Having read this post I will add it to my list of places to visit ! Love that Cave of Poetry. 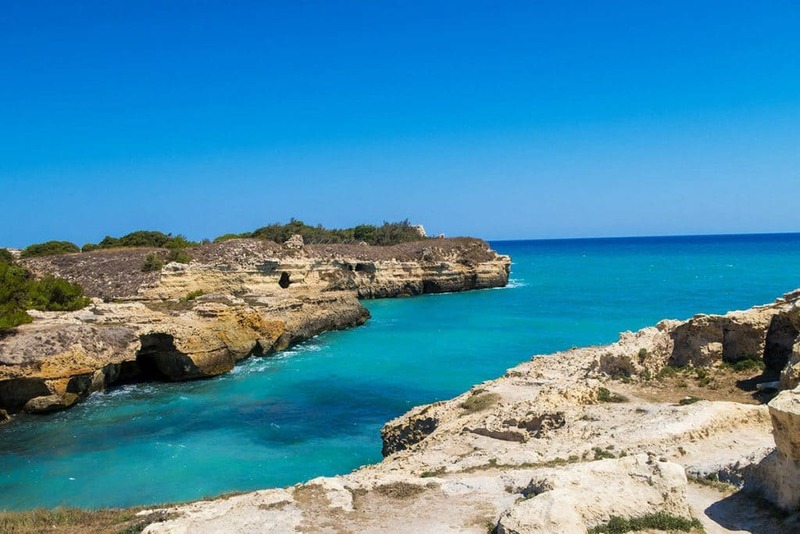 What a hidden gem you discovered in Puglia!!! The color of the sea is unbelievable! Italy totally has a lot of beauful spots. 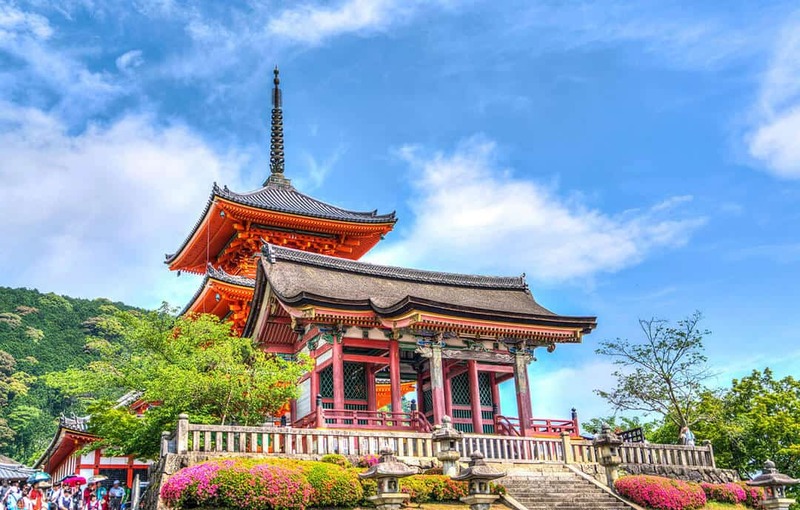 The cities are already gifted with stunning architecture and history, and great nature. Love it! 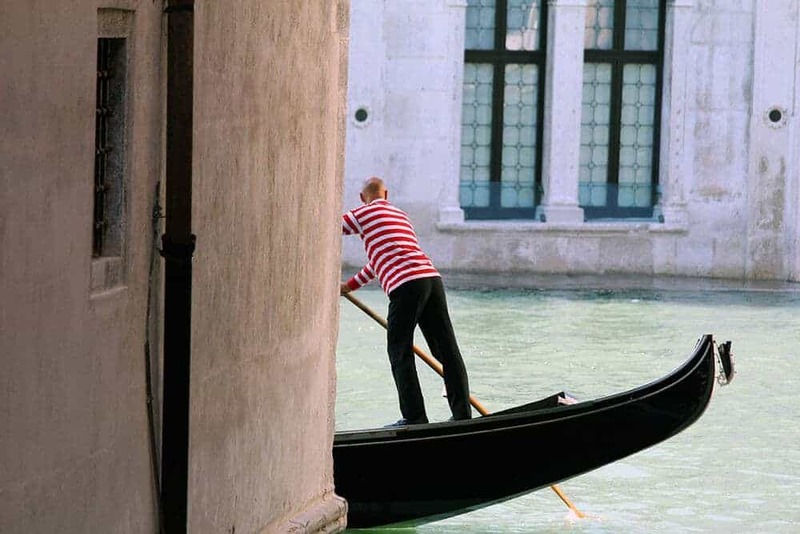 I spent 2 weeks in Italy and unfortunately didn’t visit any of these offbeat places. Good that you celebrated your Bday at such an exotic place. It is a good deed Exploo is doing by highlighting lesser known places to travelers. Gorgeous photos, and those turquoise pools looks amazing. i’m surprised there are no sandy beaches. Pity about the winds though, otherwise it looks like an interesting spot to visit. Wow, the colour of the water is enough to make me want to pack a bag and leave for Puglia tomorrow! And I do love the idea of spending your birthday away. Maybe I should start doing that too now there’s a lot more candles on my cake than I am comfortable with! Ha! This place is absolutely beautiful. The seafood looks amazing, would love to try it. The water is calling me. Thanks for sharing. I’ve saved the pin, this is a place I look forward to visiting. Italy is one of the countries on my bucket list. You always hear about the major cities, so it’s refreshing to read about seashores and fine eateries with unique character. Great read. Such an awesome way of celebrating your birthday. You have collected memories for a lifetime. I love all the pictures too, especially the ones by the lake. Cheers!! Yes! Travel instead of parties is the way to go. We take our 5 year old traveling every year around her birthday. She’s been to Mexico, Hawaii and then when she turned 3, we let her have input. She chose Panama one year, Thailand another and this year wants to go to Tokyo so we are heading there next month. This looks like a wonderful place, I love the water color! Lovely escape.. pictures are very motivating and inspiring us to plan it out!! Can’t get over the colours in that water, it looks amazing. Wow. What a beautiful place to visit! I’m glad you went off the traditional path on this one. We feel the same when we are traveling as well, we don’t like to deal with the overwhelming crowds as that’s what we have everyday here in NYC. So an escape to a slower and more traditional side of the area is always a plus. 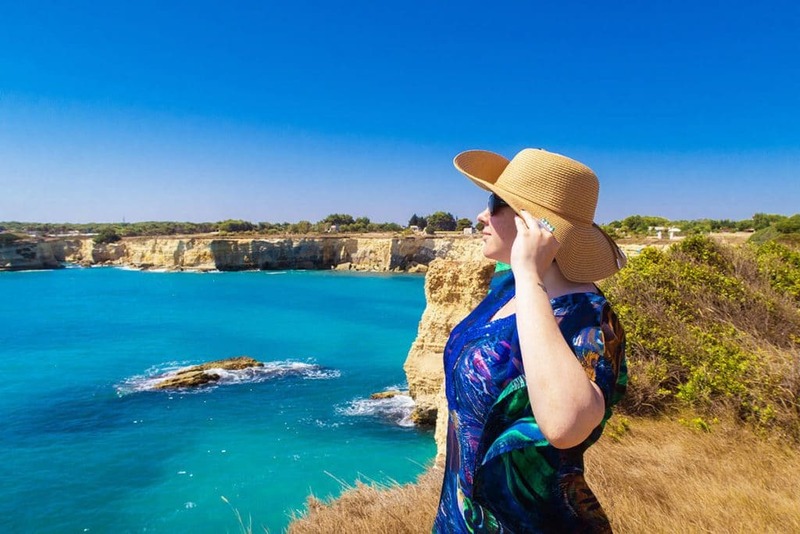 I’ve been obsessed with Italy for the longest time and have wanted to visit Puglia for a while – now I definitely have to go! It looks so wonderful, and your pictures give such a wonderful vibe. Definitely booking! What a great place to have a birthday party! I can think of worse places to be. I certainly wouldn’t mind celebrating my birthday there. Is there any part of Italy that is less than perfect? Puglia now. I have to plan a third trip to this amazing country…still a lot to see. What stunning photography! A very in depth and interesting article of the area, the Torta Crepes sound heavenly ? Really great and detailed overview about what you can do in Puglia – especially to avoid crowds. All of those turquoise waters are absolutely mesmerizing! I would love to visit and take a dip in the Cave of Poetry. Thanks for sharing! OmG! Trully a wonderful place and must to visit. The pictures are hillarious too. Have to put this on my travel wishlist. I love Puglia, but I have only been there once on a cruise ship for the day. Great tips & good to know about the wind! Going to explore one day. The iced coffee with almond milk sounds divine! I think that alone has me sold. I will need to plan a visit…..